Performance Time: Approximately 45-60 minutes, 39 pgs. COMEDY. 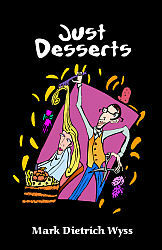 This short play collection contains three sweet treats to tantalize your audience. In “Just Desserts,” a husband tries to woo his wife with a romantic weekend getaway, but his plan backfires when his wife falls in love with a piece of chocolate cake. In “The Tao of Mittens,” a couple debates the great mysteries of life like where all the missing socks go, why you can’t find anything when you’re looking for it, and why no one claims anything from the lost and found. And in “Aviation Blonde,” a woman betrays the most important man in her life—her hairdresser—to pursue a forbidden desire…blonde hair!